The West High School Marching Band performing at Disney, crossing the front of Cinderella’s Castle. Courtesy photo The West High School Marching Band performing at Disney, crossing the front of Cinderella’s Castle. 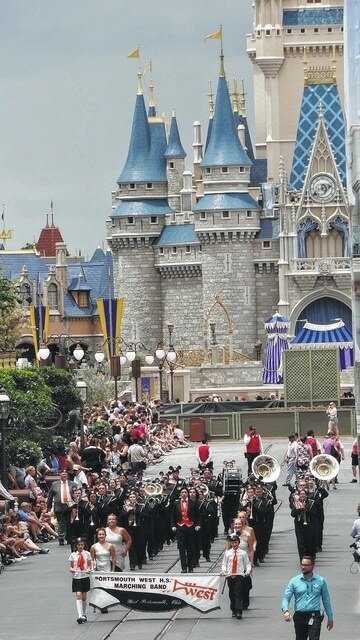 Members of Portsmouth West High School Marching Band became stars of their own Disney show on June 3, when they entertained resort guests at the Magic Kingdom Park. Pierce said that a trip to Disney has been a goal of his since he began directing the band eight years ago, but it escaped him between competitions and the attempt of receiving new uniforms. This trip was the last one Pierce will take with the West Portsmouth High School Marching Band, since he has officially retired from education after 34 years. The band performed the school’s song, as well as a medley of Disney songs. “The trip to Disney and the marching in the parade was just a great way to culminate my career,” Pierce said. Vocal, instrumental and dance ensembles from all around the world perform each year as a part of Disney Performing Arts at both the Disneyland Resort and the Walt Disney World Resort. Once selected, they are given the opportunity to perform at the resort for an international audience of theme park guests. Many entertainment outlets throughout the country submit applications to perform in the daily parade, but few receive the honor. Pierce said that the band had to submit a video of a performance and a list of achievements and awards to receive a spot in the parade. “There were a few bands to march and perform, but we led the parade,” Pierce said. “It is a very select opportunity for skilled bands. Only one of 20 bands that apply are chosen to perform. Ryan Urban has been hired as the new band director and the students have already received their music and are preparing their upcoming season.